Fixing TIM is a visual mining and analysis tool implemented as a solution to the 2013 BioVis Data Contest. Through a collection of linked views, experts can inspect the sequences and structures of proteins, in order to identify protein mutations and to help discover the effect of these mutations on protein function. We follow a client-server approach in which distributed data sources for 3D structure and non-spatial sequence information are seamlessly integrated into a common visual interface. Multiple 3D rendered views and a computational backbone allow comparison at the molecular and atomic levels, while a trend-image visual abstraction allows for the sorting and mining of large collections of sequences and of their residues. We evaluate our tool on the triosephosphate isomerase (TIM) family of structural models and sequence data, and show that our tool provides an effective, scalable way to navigate a family of proteins, as well as a means to inspect the structure and sequence of individual proteins. More information about the project, as well as a download link, can be found at the official website. Journal Paper: T. Luciani, J. Wenskovitch, K. Chen, D. Koes, T. Travers, G.E. Marai. 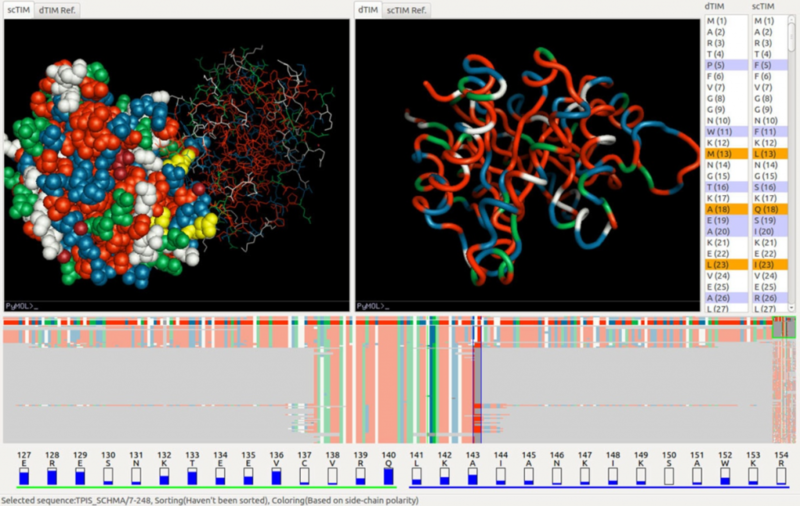 “Fixing TIM: Interactive Exploration of Sequence and Structural Data to Identify Functional Mutations in Protein Families.” BMC Proceedings 2014 8(Suppl 2):S3.